I took this picture of an Austin 7 on a day out in Wales. It's a car I have always thought of as one of the great icons of the twentieth century. As can be seen in this example and the one following I often create images from original photographs. 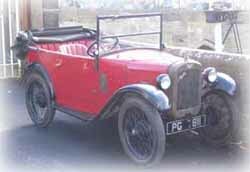 The image was created from the photograph by referring to it for the details and proportions of an Austin 7. The image was produced using a vector drawing application. Then it is a simple matter to change the colour, size or direction.